Your Verdict > Was Edward Collins Tortured? Edward Collins, an English merchant, was the great survivor of the Amboyna case. He confessed to an involvement in the plot and was found guilty alongside his countryment but was reprieved just before he was due to be executed due to an act of clemency. For the Prosecution, Collins is a vital support for the case. He was the one plotter who confessed without torture. 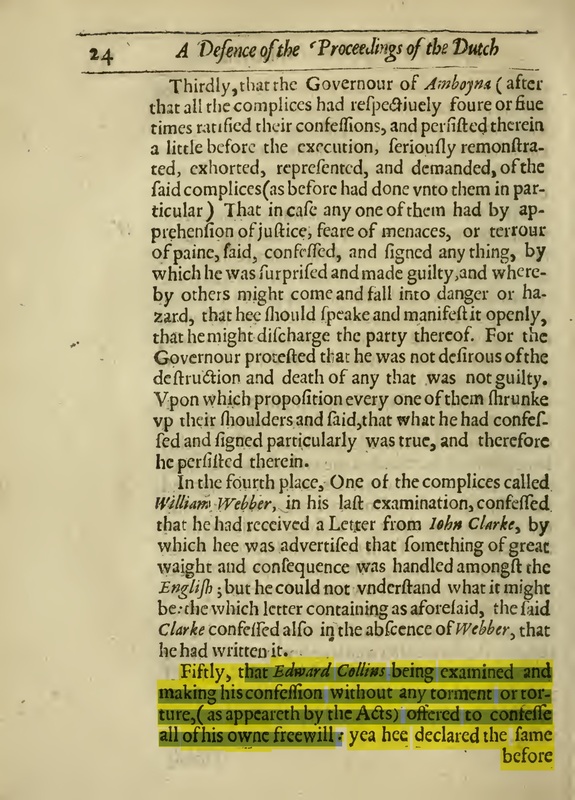 In a case marked by the use of torture, Collins’ was uniquely important because his free confession of the key details of the plot without prompting served as counter to the charge that all of the evidence had been extracted by the use of the torture chamber. 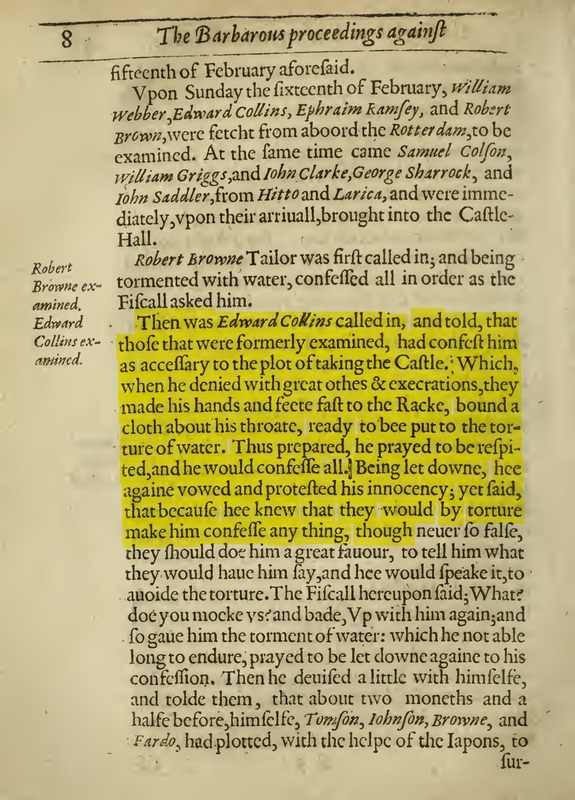 However when he returned to London, Collins claimed that he had in fact been brutally tortured and the Defense argued that he, like all the supposed plotters, was compelled to confess only after the brutal application of waterboarding. Every single Amboyna judge said the same thing. Collins willingly confessed without any prompting. He was not “tortured at all, not yet threatened to be tortured but freely confessed the act saying to the Secretary write what I shall say unto you I will tell you the truth.” The act of free confession is absolute proof that a plot did in fact exist. Here we see a guilty man absolutely willing to confess to guilt and requiring neither torture nor prompt. Like all the other English merchants at Amboyna, Collins was brutally tortured and being unable to endure the torture he confessed. His experience was typical. He was strung up, brutally tortured, and only when he could not stand any more did he confess. The Prosecution’s claims that he was not tortured are nothing more than fiction invented to serve Dutch aims. Embedded video for Was Edward Collins Tortured?